Our low-cost Flat Fee Collection Program is designed to retain more customers, while increasing your immediate cash flow. There’s a reason why A.R.M. Solutions has been recognized in Forbes Magazine as one of the top 10 collection agencies in the United States. We listened to our clients − and based on their needs – we developed a solution that approaches the receivable process from an entirely new perspective, with results that dramatically exceed the average national statistics. Lower Costs– Our “Flat Fee” Collection Program works out to a cost less than 6%, with NO commissions. That’s 1/5 the cost of traditional collection agencies! Increase Recovery Rates− A.R.M. Solutions averages over 42% recovery!! This exceeds the national average by over 300%. Ask about our No Risk Performance Guarantee! Increase Your Cash Flow – All payments go directly to you, significantly increasing your immediate cash flow. Retain More Customers − Our diplomatic approach allows you to resolve customer service issues and retain more customers. Maintain 100% Control of Your Accounts – You maintain full access to current standings on all accounts through A.R.M. WebView™, our 24/7 secure web portal. And, you may intervene at any time, on any specific account to preserve client retention. Simply put, our program is modeled to cost less and deliver more favorable results than a typical collection agency. Let’s take a look at each of these benefits in detail. If you would like a private consultation to walk through our system, contact us or call (888) 772-6468 for immediate assistance. Many companies hold off on turning accounts over to a collection agency to recover past-due accounts, because the cost is so high. 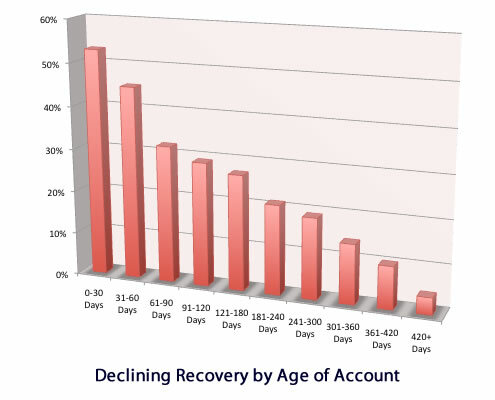 The first option is to have your internal resources try to recover aging accounts. At the same time, new incoming aging accounts also need to be addressed. This stretches your internal resources and dilutes the efforts of your team. The last resort is hiring a traditional collection agency to work on a contingency basis that charges a 25% to 50% commission. By doing so, you lose control of your customer relationships and there is a higher potential for them to run straight to your competitor. We may have the answer you’re looking for. A.R.M. Solutions’ “Flat Fee” Collection Program charges a low fixed rate that averages less than $10 per account, regardless of the balance size. On average, that works out to a fee of less than 6%, or 1/5 the cost of a traditional collection agency. A recent study by the American Collectors Association (ACA) shows that internal collection efforts lose over 76% of their effectiveness after the 60th day. By entering the process earlier in the A/R timeline, A.R.M. Solutions provides a diplomatic 30-45 day “pre-collection” program that reduces your costs by 50% to 75%. This allows your team to focus on accounts earlier in the receivable cycle, when they are most likely to respond. This results in fewer accounts moving into the collection phase, lowering the cost of your overall collection efforts. A.R.M. Solutions averages 42% recovery rate on past due accounts, while national statistics indicate that collection agencies average only 14%. Typically, collection agencies will sort through your database and work on the higher balances first. A.R.M Solutions treats every single account − regardless of the amount owed – exactly the same. We don’t cherry pick which accounts we want to work on. Remember…in this program, we don’t charge a commission! Our Flat Fee Program, gives you the opportunity to review and approve each correspondence that will be sent out to your database. Once we have your stamp of approval, the first written demand on A.R.M. Solutions’ letterhead goes out to each of your accounts within 24 hours. Our third-party representation brings many clients to action. Slow paying customers often just need to be “nudged” rather than hit over the head with traditional collection agency tactics. We’ve demonstrated time and again that a series of diplomatic and strategically timed payment reminders from a licensed 3rd party results in a dramatic response by customers who ignored previous notices from your organization. Contact us directly at (888) 772-6468 to learn more about our No Risk Performance Guarantee! In addition to recovering more and costing less, our Flat Fee Collection Program increases your immediate cash flow. All payments go directly to you, and A.R.M. WebView gives us an open line of communication, so we know when an account is paid off, or there is a balance change. And, because we have a proven track record for success, you will also see a decrease in your bad debt write off. Our diplomatic approach is designed to be “effective”, not “offensive” to your customer. We develop scripts for each point of contact, and you review and control the communication process from start to finish, to maintain positive relationships with your clientele. Because we take a diplomatic approach, past-due customers are more communicative. If we see that a non-payment issue is actually a customer service issue, we report the problem to you immediately so you can step in, resolve the issue and retain the customer. You are always in complete control, and can remove an account from the program at any time. And, because the A.R.M. team is trained to represent you in a favorable manner, your customer is much less inclined to shop for another service to replace you. Unlike typical collection agencies, A.R.M. Solutions delivers technology that gives you secure 24/7 access to all of your accounts. A.R.M. WebView™ gives you a real-time snapshot of your account status any time you need it. You can also enter new accounts − any time and from anywhere – using a simple web browser. Visit our page on A.R.M. WebView™ to learn more. If you’d like a private demo, please contact us or call (888) 772-6468 to set an appointment. A.R.M. Solutions Flat Fee Collection Program is a proven system that costs less, recovers more and helps you retain more customers. If you have very specific needs, we’re happy to work with you to design a customized program that’s just right for your customers. Let’s discuss what A.R.M. Solutions’ Flat Fee Collections can do for your company. Please contact us today.